May 3 seems so near, yet so far. That’s the U.S. opening date for Marvel’s rabidly anticipated Iron Man 3, which kicks of Phase Two of the Marvel Cinematic Universe. I absolutely cannot wait for this movie, so even though it will be posted a million other places I wanted to share this new clip Marvel released. In it, Tony Stark (Robert Downey Jr.) directly calls out the Mandarin (Ben Kingsley), the film’s central villain. We keep hearing that Iron Man 3 promises a darker, more serious entry in the franchise and the trailers seem to back that up. So does the intense focus in Stark’s deliver to the assembled reporters in this clip. 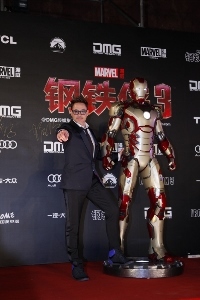 Robert Downey Jr. was in Beijing for an Iron Man 3 promotional gala. 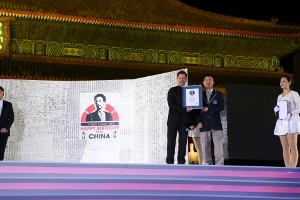 In China, moviegoers will be treated to an exclusive extended cut of the film that won’t be released theatrically elsewhere in the world. Actress Fan Bingbing appears only in the Chinese cut of the film. Here’s a link to video footage of the premiere event with comments by Downey. Let’s hope the series can make the transition after a change in directors (Shane Black took over where Jon Favreau left off from the first two). For more information, visit the official Iron Man 3 website and Facebook page.